If you’ve ever ridden the Pyrenees cols, you’ll no doubt be able to relate to such idioms. 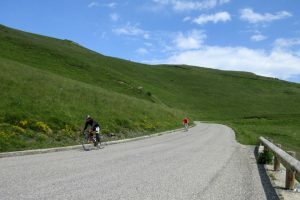 But there are ways in which you can maximise your chances of success on the cols and, more importantly, your enjoyment on the climbs. We sure you’ll find these cycling tips and tricks useful. They are the result of over 10 years of sometimes painful experience cycling in the Pyrenees! 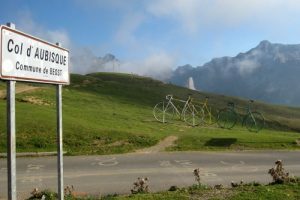 Our major cols include Portet d’Aspet, Col de Menté, Port de Balès, Péyresourde, Aspin…they all come with their challenges which change according to the season. Whether it’s a question of preparation, bike set up or experience, we’ve been there, done that. We hope you can learn something from our experiences! 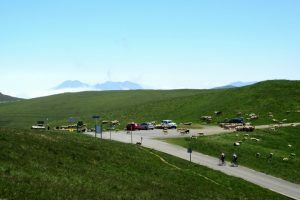 Sites such as cyclingcols.com are invaluable for checking out col vital statistics which include not only distance and average gradient but also what max gradient you are likely to encounter. The handy graphics give you a kilometer by kilometer breakdown so you can see in advance where you are likely to get some respite, or not as the case might be! This will help you to prepare mentally for what is in store. 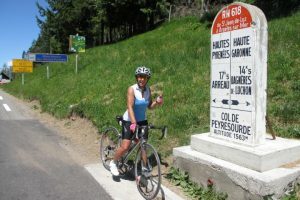 If you are planning a self-guided cycling holiday, this critical col information will also enable you to prepare your col hit list before you arrive. Your choice of gearing will be a personal thing taking into account your fitness and how hard you want to make things for yourself, but a 34×25 should probably be a minimum and compacts are generally the cassette of choice here. So you’re about to tackle your first col of the trip. Our top tip, right here is don’t go off too fast, egged on by your mates. This is no time for bravado and one-upmanship. Get into a comfortable gear at the bottom of the climb and get a steady rhythm going. There’s nothing worse than running out of juice mid climb. My other half has called my col climbing style ‘infuriatingly metronomic’, but I take that as a compliment! Pace yourself correctly and you may well have something left in your legs on the upper reaches meaning you’ll be able to knock it up a gear and give it some gas in an impressive finale. Unless you are lucky enough to have a fat-adapted metabolism which will ensure a constant energy source for your ride, you will need to fuel your col climbing efforts. Our top tip is to make sure you know what works for you before you come down to play in the mountains. Don’t head for the cols with jersey pockets stuffed full of gels and bidons laced with magical mixes of sports fuel that you have never tried before. You may get a nasty shock mid climb as your body rejects the magic potion that you were counting on! Ideally, get your fuel in before you start the climb so your body has time to digest it and get the energy to your legs. Make sure you drink regularly too, but sips rather than big gulps. As the climb steepens, move your position forward on the bike so as to put the maximum amount of power and energy into the pedals. Relax your shoulders, keep your upper body still and avoid rocking from side to side. Concentrate on putting all of your effort into those pedal strokes. Keep your core engaged as it is those muscles that support your back and keep you stable on the bike. Pull as well as push on your pedal strokes, keep them smooth with an even stroke on each side. Be aware of your breathing and avoid short, shallow, gasping breaths. Instead, take deep, quality breaths that originate from your abdomen rather than from your diaphragm. This will not only maximise your oxygen intake but will also help you to relax as you work. As you focus on your breathing technique you’ll find that it becomes a welcome distraction from the physical challenge of the climb. You will also be amazed at just what a difference the correct breathing technique will make to your cycling. As with climbing, our top tip is just to relax and breath. Don’t over grip the handlebars. It’s a bit like skiing. The more you tense up, the more likely you are to come a cropper. Before you come out to ride the cols, make sure you’re comfortable riding on the drops. Don’t expect to be able to negotiate a whole descent riding on the hoods as it will put a huge amount of pressure on your fingers, hands and arms, not to mention your back. Getting down on the drops also enables you to operate the brakes much more effectively. Your weight will be more evenly distributed over the wheels and you’ll have a lower centre of gravity when you are on the drops which will improve your stability as you go around the corners. Look ahead to the exit of the corner rather than concentrating on what’s immediately in front of you. Pick your line and don’t go into the corner too fast. Brake before you hit the corner and go into it at a controlled speed. Release the brakes and aim for a smooth exit. Lastly and most importantly, unless you are doing a closed-road sportive, do remember that you will be sharing the road with other cyclists and especially with cars and motorbikes. Don’t cut those corners unless you are absolutely sure that the road ahead is clear. Starting out with the correct mindset can greatly increase your chances of successfully conquering the cols. Don’t allow any thoughts of ‘this is going to be hard’ or ‘I don’t think I can do this’ to enter your mind. Believe you can and you will. Think only positive thoughts and banish any negativity. Concentrate on the road immediately in front of you rather than looking too far ahead at a seemingly unending 8% gradient. Get ‘in the zone’ and concentrate on just keeping those pedals turning. Don’t worry about how others are riding the climb. Do your own thing and don’t be fazed if you are passed. As mentioned above, if you can discipline yourself to set off at the right pace, you may well have the satisfaction of passing others as you near the top of the climb. The autumn is our favourite time of year for cycling the cols of the Pyrenees. The weather is generally stable in SW France with sunny days and temperatures into the low and sometimes even the high 20s. The roads are quiet and the scenery spectacular as the colours change. 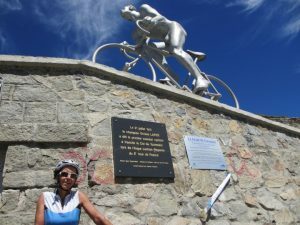 However, July and August are when we see the most cyclists on the cols of the Pyrenees. They are also the hottest months of the year with temperatures regularly rising to the high 30s by mid afternoon. Read our previous article on Top Cycling Tips to Beating the Heat in which we gave you some invaluable tips on this important subject. Bear in mind that conditions can turn on a sixpence in the mountains so, regardless of the temperature when you set off, always carry a lightweight windproof in your back pocket for those long swooping descents. 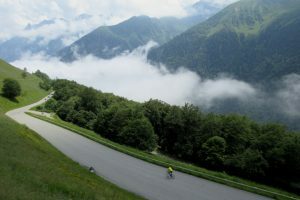 Whatever time of year you choose to cycle the cols of the Pyrenees, you’ll enjoy amazing cycling on quiet and well maintained roads where the drivers are courteous and respectful towards cyclists and the locals are friendly. Add to this the delicious regional food, great value accommodation and easy accessibility via Toulouse airport and you have no reason not to include the Pyrenees in your cycling plans. Thanks to their network of local professionals, The Adventure Creators can create custom guided cycling holidays with full logistical support, designed around the kind of riding you want to do but with the benefit of our local knowledge and expertise. 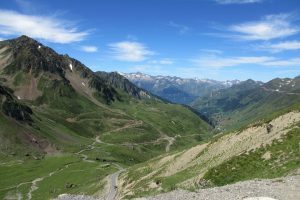 We can also put together tailor made self-guided cycling holidays in the Pyrenees complete with road books, route advice and circuits backed up by GPS tracks and printed maps.